Why is education important for Afghanistan? Kabul, Afghanistan, 21 February 2019 – Today, the Government of Afghanistan, the Education Cannot Wait, global fund for education in crisis, and UNICEF launched a multi-year (2018 – 2021) education response programme, for which an initial US$ 22 million has been secured. The new programme will support the government’s policy on community based-education and improve access to safe and reliable education for 500,000 most vulnerable children, including 325,000 girls, in Afghanistan annually. At Education Cannot Wait (ECW), we believe in the right of every girl and boy in Afghanistan, especially those affected by crisis, to learn free of cost, without fear and in safety to enable them to grow and reach their full potential. An estimated 3.7 million girls and boys do not have access to education in Afghanistan. 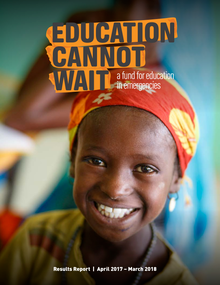 Significantly, 60% of out-of-school children are girls, and in some provinces as many as 85%. Moreover, 95% of children with disabilities are not able to attend school. 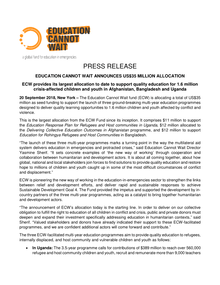 New York, 6 July 2018 – The just-released ECW annual results report shows ECW’s investments have reached more than 650,000 children and youth affected by conflict and natural disasters during the Fund’s first year of operations from April 2017 to March 2018. In total ECW invested US$82 million in 14 crisis-affected countries.